You’ve probably seen a lot of eerily similar celebrity doppelgängers on the internet, but Nicholas Gifford takes it to a whole other level. One glance at his face and it’s obvious that he looks exactly like the War Rig from Mad Mad: Fury Road! You’re probably thinking that Nicholas set out to mimic Imperator Furiosa’s battle truck, but nope, it’s just a bizarre coincidence. If you check out his Facebook page, you can tell that he’s appeared this way at least as far back as 2004, when he joined the social media site, a full 11 years before Fury Road hit theaters. For all we know, Nicholas hasn’t even seen Mad Max yet and is confused when strangers shout “What a lovely day!” at him. According to his LinkedIn, Nicholas is currently employed as a warehouse manager at Staples. But if he ever gets tired of that profession, he could probably line up a steady gig taking photos with people on the convention circuit. What movie fan wouldn’t shell out $20 to snap a pic with Mr. Rig himself? 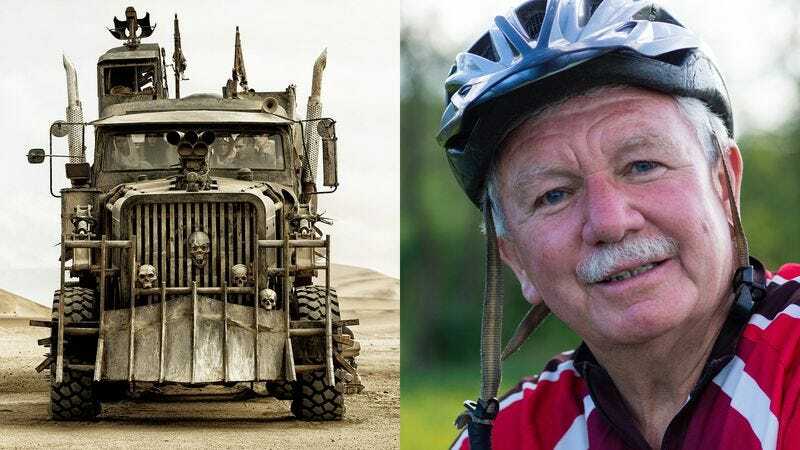 Director George Miller, if you’re putting a truck in the next Mad Max sequel, we’ve got three words for you: Cast this man!